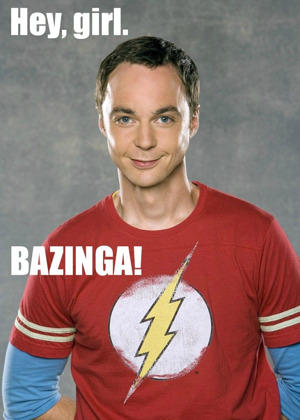 I've gotten into the habit of watching reruns of “The Big Bang Theory” on TBS every night with my fiancé, Matt. While I have nothing but love for Sheldon, Leonard, Howard and Raj, I don’t always love seeing the same 20 commercials over and over again, day after day after day. One interesting thing about seeing the same commercials a lot is that you become a sort of guinea pig for the effectiveness of different ads. Matt and I are pretty much smack in the middle of TBS’ advertisers’ target markets. Most of the ads that run during “Big Bang” completely apply to us. So, how many of them actually convert us into qualified leads? The fact that I love the ads so much but haven’t yet been converted into an AT&T customer got me thinking. As a marketer, I strive to create content that’s both useful and entertaining. I fully admit that I am completely entertained by the little know-it-all girl with pigtails who says, “What about infinity times infinity?”, but is it advantageous for AT&T to entertain me without converting me into a customer? A few weeks ago, I saw a commercial for Credit Karma, a service that gives you your credit score for free. Other companies like it have come and gone (CreditReport.com, for example, which had those great ads featuring catchy, self-deprecating songs), making the venture somewhat risky and hard to succeed at. Credit Karma, though, has a secret weapon its predecessors didn’t: unnervingly spot-on messaging. The company’s ads feature a girl (or guy, depending on which ad you see) conversing skeptically with the Credit Karma website. Her words ring true in the most perfect way. And he did. The next day he reported that CreditKarma.com was actually free, and he’d gotten his credit score just as easily as the ads said he would. The next thing I knew, I was on their website trying it out for myself. From my perspective, the difference between the AT&T ad and the Credit Karma ad comes down to buyer personas. AT&T’s ad charms me every time, but it doesn’t speak to anything that really matters to me when it comes to wireless service. If AT&T had interviewed me, the company might have found out what I don’t like about T-Mobile. (For example, the fact that every time I get a new phone, it comes pre-loaded with multiple T-Mobile branded apps that I can’t uninstall no matter how hard I try.) A commercial that spoke to those pain points in a charming way might have actually perked up my ears and caused me to check out AT&T's pricing and plans. Credit Karma, on the other hand, read my mind. The company’s ads are truly buyer persona-based. Credit Karma clearly understands the pain points of its target market and wastes no time addressing them. And guess what….it works! It worked on two real live people in my household, one of whom is a skeptical marketer. And it has probably worked on many, many other people all over the country. The takeaway here is clear: Buyer persona-based messaging converts. It converted Matt and I, and it just might convert your customers, too.